Tropical Depression 12W formed in the Philippine Sea and NASA-NOAA's Suomi NPP satellite analyzed the storm in infrared light. The depression strengthened into Tropical Storm Ampil later on July 18. On July 18 at 12:48 a.m. EDT (0448 UTC) when the Visible Infrared Imaging Radiometer Suite (VIIRS) instrument aboard NASA-NOAA's Suomi NPP satellite captured an infrared image of the system it was still a depression. In the VIIRS image, Tropical Depression 12W appeared elongated, and contained some very cold cloud top temperatures near minus 80 degrees Fahrenheit (minus 62.2 degrees Celsius). NASA research has shown that storms where cloud tops are that cold extend high into the troposphere, and can generate heavy rainfall. 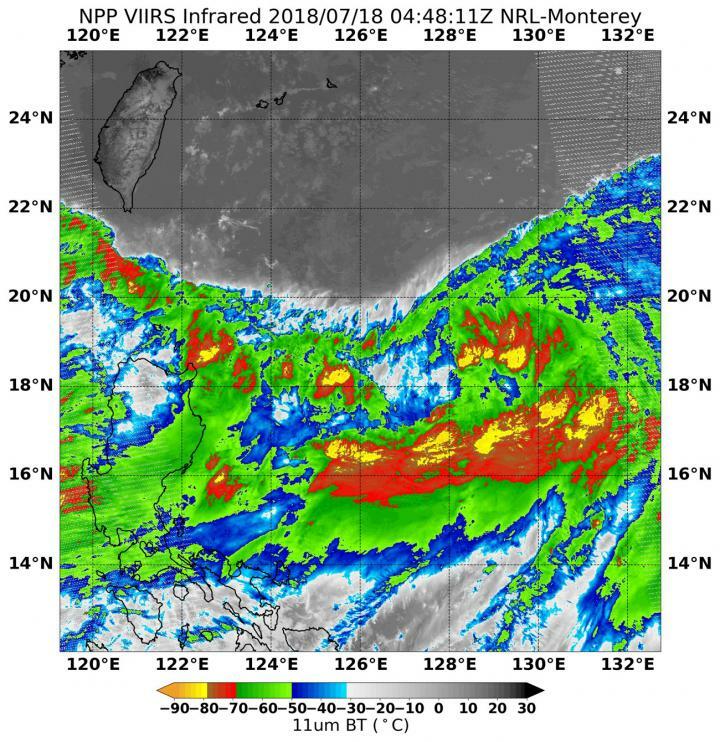 Animated enhanced infrared satellite imagery 10 hours later showed that Ampil was continuing to consolidate but still had an asymmetric cloud field. At 11 a.m. EDT (1500 UTC) the Joint Typhoon Warning Center (JTWC) reported the center of Tropical Storm Ampil was located near latitude 19.6 degrees north and longitude 129.0 degrees east. That's about 429 nautical miles south of Kadena Air Base, Okinawa Island, Japan. Ampil was moving to the east. Maximum sustained winds were near 40 mph (35 knots/62 kph). JTWC expects Ampil to move to the northeast, then curve northwest and move through the southwest islands of Japan or the Ryukyu Arc that stretches from Kyushu to Taiwan.